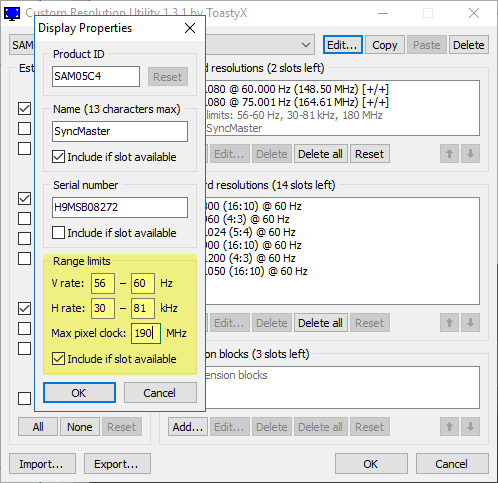 Hi, I have a Samsung SyncMaster XL2370 connected to a Radeon HD 5870 through a DVI-D DL cable. In LCD Reduced (164.61MHz) mode my monitor can handle up to 76hz (164.81MHz), going black at 77hz (164.96MHz). In LCD Standard (174.57MHz) and LCD Native (185.63MHz) the screen becomes extremely blurry even at 75hz. I've tried messing around with Range limits, increasing Max pixel clock to 190MHz (it was 170MHz originally), but the screen is still blurry. From what I understand, LCD Reduced forces my GPU to run at 400MHz/1200MHz all the time, that's why I'm trying to achieve 75hz in LCD Standard or Native. Is this a hardware limitation, or did I setup something wrong? Did you try the pixel clock patcher? I thought I didn't need to, since I'm using a DL cable. The 'stock' limit should be 330MHz, right? I'm not even close to that. The XL2370 doesn't have dual-link DVI. It needs a single-link signal. Oh, I see. I assumed it did, since the port has additional 'holes' in the middle. That's just for compatibility then, I guess. I'll try patching and report back here. Thank you ToastyX, I appreciate your work and how you keep helping people to this day, no matter how dumb their questions are.